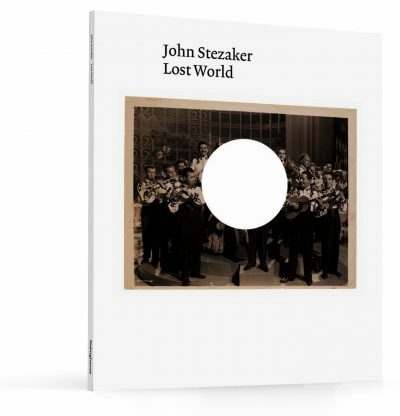 Published in conjunction with an exhibition of John Stezaker’s collages and found objects at City Gallery, Wellington, New Zealand, Lost World contains ‘After Images’, a conversation between the artist and David Campany. David Campany: John, your exhibition, Lost World, concentrates on work from the last decade or so, but can we go back for a moment? You have been making collages with photographic material for over forty years. Where did the interest begin? You attended London’s Slade School of Fine Art in the early 1970s. Did you go there with an interest in the photographic image? John Stezaker: I had a collection of photographs before I went to college; postcards mostly, a sepia dog calendar that I remember with affection, and my mother’s old shopping catalogues. The first paintings I did, when I started at the Slade in 1967, were enlargements of tiny collages made from shoe adverts. I found the enlargement process slavish. The paintings were not as interesting as the collages, and the collages were not as interesting as the original images. This led to a crisis in my first year, which resulted in my giving up painting. I realised that nothing I could do with these images, which I found fascinating, improved on them, and that, in order to be fascinated by an image, it already had to be there, it had to be found. The processes of enlargement and media transcription only seemed to diminish the power of the found image. This was when I began to see my process of collecting, fragmenting, and reassembling images not as my preparatory activity but as my primary one. And I quickly expanded it, scouring secondhand bookshops and the dustbins of the film studios in Soho. I discovered situationism around this time, which offered some justification for what I was doing. Did you feel you needed justification? Was that to do with the politics of avantgarde art at the time and its suspicion of fascination? Or, was the need for justification more to do with the complicated relation between ‘finding’ existing images and the creative act? It is more complicated. My tutors and everyone else thought my paintings were ‘pop’, and, though I had an interest in Richard Hamilton, I wanted to avoid that association. By stopping painting, the association disappeared. In the political atmosphere of the art-school occupations that occurred that year (1967–8), situationism and the process of détournement seemed to justify my collecting activities, which my tutors saw as ‘giving up’. Re-captioning images suggested a critical relationship with the found image that was absent in pop’s unquestioning celebration of consumer culture. But, in the end, the captions and their political justifications became obstacles to my image fascinations, and they took a lot longer to dispense with. Fascination is, almost by definition, beyond will, beyond conscious intention. I get the impression your collages come from the fine balance you seem to strike between accepting your fascination with images and wanting to reflect on it, like a dreamer, contemplating their own dream. Yielding to fascination means overcoming the habit of using found images, of consciously manipulating and controlling them. I resist subordinating the image to any concept or legible use. My aim is to free it, to let it reveal itself from behind the cloak of familiarity. I have found following my own image fascination difficult. It is always in conflict with my conscious intentions and leads me into unexpected, sometimes unwelcome territory. But fascination has become the only rule in my work—to follow it wherever it might take me. That is why digression is so important as a way of escaping conscious control. Collage is a way to create the circumstances for digression and for attention to the unintentional or inadvertent, as you say, for allowing a conscious contemplation of the image in its dream state. I only started using the word fascination after reading Maurice Blanchot and Georges Bataille in the late 1970s, early 1980s. Fascination is a relation with images divested of conceptual content and intentionality, images which have lost their connection with everyday legibility—after images. Bataille associates fascination with such images; images that have, in a sense, died. He defines fascination as a form of ‘morose delectation’. Blanchot, similarly, describes fascination as being for what is left behind in the image, in the mortal remains. You’ve worked extensively with old film-publicity stills and old postcards. Symbolically, the film still dies once its publicity function ceases. The postcard dies after it has been bought, sent, and received. But when images die, they do not automatically disappear. Many persist, zombie-like, to continue the metaphor. But when you talk about this being the state in which it is possible to ‘free the image’—‘in order to let it reveal itself’—this too is a metaphor. The meanings, ambiguities, and energies of images are not literally in them. They must be in us, no? In us and outside us—that is the ambiguity of the image. In Blanchot’s words, the image is ‘between here and nowhere’. In other words, when we read an image, we do not necessarily see it, or, if you prefer, we see only what the image is designed to show. Blanchot went on to describe the way utensils ‘disappear into their use’, only to appear in their obsolescence or dysfunction. The same applies to images. As they fall out of use, we see what was previously invisible or neutral. It is a matter of seeing what is betrayed by the image rather than what it transparently signifies. This accounts for your interest in the kinds of imagery you use, the ‘raw material’, but what of the cuts and collage? Are these additional means of bringing out what is betrayed by the image? Or, do they bring extra significations? Both. With the image fragments—where I remove part of the photographic image and the resulting image remains rectangular—they become a new photographic images, each with a new central focus. We are left with the setting, a body without a head, or a familiar gesture or pose that seems to betray something of the relation between self and photographic representation. Where it works, it estranges the familiar, and this is a transformation as well as a betrayal. This metamorphosis is more obvious when the subtraction is internalised as a hole, as in the Tabula Rasa series (where an empty canvas or a shining screen replaces a central character in a film still), or, in the Circle series (where a spot-light blinds out the centre of interest in the image). Then, you could say that there is a transformation of one narrative into another. But, however transformative these devices may be, they are just other ways of displacing attention from the centre to the surroundings—the setting of the image. This is another way of allowing the image to betray itself, its ‘set-up’. In rendering ‘the star’ invisible, these works bring to the fore the minor actors and extras, whose role is usually to disappear into the background. This relation between the purported subject and the ‘set-up’ or surroundings is always a little unstable when the image is photographic, because the camera takes in everything, without hierarchy. Open the shutter and the world-as-light floods in. The camera has no conception, no way of knowing what is important in the image and what is marginal. Things like composition, lighting, or focus are rhetorical devices that indicate conventional ways to read the image. But, conventions are only conventions. They cannot exhaust the possibilities of the photographic image. So, in a way, your shifting the emphasis of the image, from subject to setting, reorients us back, to the mechanical indifference of the camera. Would you agree? In films, extras disappear into the background. The still photographer, engaged in the second photographic ‘take’, often finds it necessary to recompose the scene so that the star doesn’t get lost in the crowd of incidental details that the photograph indifferently registers. I have a collection of images that were rejected because the star got lost in the crowd. They are wonderful. You find yourself searching for a recognisable face in a sea of extras. It is a bit like spotting Jesus in Bruegel’s painting, Christ Carrying the Cross (1564). Although Jesus is dead centre and literally marked with a cross, he is always difficult to find. This makes me think about another device used in my collages—hiding. It raises other issues connected with this idea of ‘mechanical indifference’. In your collages, there’s often a fine balance between the seductive and the monstrous. Perfectly benign images, originally made to be attractive, become demonic when cut and combined. That effect was always an aspect of collage, going right back to the 1920s. But, in your work, which is often as simple as collage can be—one cut, the combination of two parts—the balance is refined, exquisite even. There is a purity to your minimal means. Is this to do with your affection for your source material, with wanting to show it and celebrate it as much as alter it? Aside from the literal cut into the image, there is the metaphorical cut that comes with moving an image from one context to another, or the cut that comes from plucking an image from obscurity and placing it under a new spotlight of artistic attention. This brings us close to Marcel Duchamp’s idea of the ‘readymade’—the nomination of a commonplace artifact as a new work of art. The object remains materially unchanged, but the new context, the new frame of reference, allows it to be reimagined, reexperienced, rethought. You have explored this yourself with certain photographs that you don’t alter at all, and in your decision to exhibit a series of hands from old mannequins. Looking back over your work, I get the impression that the paths opened up by Duchamp have been important to you. Enormously. In the early 1970s, at the height of conceptual art, it was issues of nomination and the contextual conferral of art status that interested me. But, by the mid-1970s, I had begun to discover Duchamp the surrealist and the ‘re-imagining’ of the found image or object. As you say so eloquently, this is a cut in several ways. It is, initially, a gesture of violence, then a reparative reintegration. I think of my Marriage pieces, where the half-face has to find its ‘other-half’. In my work, the broken mannequin hands seem closest to the Duchampian readymade. I found a box of them in the street, having just read a passage in Giorgio de Chirico’s memoir about his revelatory encounter with a broken disembodied pointing-hand sign. Duchamp writes of wanting the viewer’s reaction to his readymades to have the force of a snapshot—recognising something instantly, but out of context. So, there are interesting oscillations here between objects that behave like images and images that behave like objects. On this point, I’ve noticed that, though your collages reproduce exceptionally well as graphic impressions, on the page it’s difficult to capture their status as objects. Framed on the wall, you allow the images to curl a little, and the decades of accrued wear and tear are all part of the experience. Plus, of course, a cut is a cut into an object as much as an image. Yes, they become graphic in reproduction. The physicality of the work is difficult to reproduce and is important in the experience of these ruins of images. The snapshot idea has always interested me—the way an object in its dysfunction or contextual orientation becomes an image; it seems to become an image of itself. Duchamp also called these encounters arrests, stoppages, and delays. He saw them as decelerations of our contact with things that allow us the distance to see them as images. I suppose, in your terms, they achieve objecthood at the expense of their temporality. I have always made the connection between cutting and arresting the image. In fact, one of my earliest groups of collages, titled Cut, was a play between my own act of cutting and the film director’s command. Cutting, after all, arrests the still image’s indifferent legibility and transparency. I like to think of my Damage pieces—found damaged photos—as readymade eruptions of physicality in the midst of the momentum of our everyday encounter with images. As film stills stand in as arrested cinematic moments, this makes these found and cut objects images of images, or arrests of arrests. A cut is a peculiar kind of intervention. There and not there. It’s not really a ‘mark’, like a brushstroke. It can be very apparent or hide itself seamlessly. The kind of montage we see in narrative cinema and in advertising hides the cuts. The avantgardes have always tended to keep the cut active, palpable, thinkable. It is interesting that, at the same time, that the surrealists turned to collage, they also turned to filmmaking. In films such as René Clair’s Entr’Acte—made in 1924, the year the journal La Révolution Surréaliste was launched—the audience is given a thrilling lesson in the associative potential of editing; what one shot can mean in light of another and another. Although you have been interested in film for a long time, it’s only recently that you have made films yourself. What prompted this? Actually, I made films as a student in the late 1960s and early 1970s, and, in 1973, on my first adult trip to Italy. Having discovered Giorgio De Chirico, I started to collect postcards of equestrian statues in silhouette. I hoped to animate these as a flip-book, but nothing came of it. More than a decade later, I came across a book, the Stallion Annual, containing hundreds of identically formatted images of horses. And that’s when the idea for the film Horse (2012) occurred to me: hundreds of images of horses projected, each for twenty-fourth of a second. It was several years before I found a second Annual, and it was only with the advent of the Internet that it became possible to collect enough of these publications to make the film. I thought of it as a reverse Muybridge. Rather than breaking down and re-integrating a multiplicity of images into movement, I was starting with a multiplicity of horses and attempting to create stillness. At the same time, I had been collecting images of steam trains with a similar aim in mind. But rather than stilling, I wanted to create a slow-motion version of the approach of a train composed of thousands of different trains. I was thinking of the Lumières’s L’Arrivée d’un Train en Gare de La Ciotat (1895), the first film to be screened publically. Along the way, as an experiment, I wondered what would happen if I didn’t have a singular central object of attention. The results were the films Blind and Crowd (both 2013), which opened up a new dimension in cinema: the experience of inapprehensible multiplicity. It seemed that I had stumbled upon a cinema of discontinuity, one that does not make us see the same thing but exposes us to difference. Every time I saw these films, I was aware of having a different experience. No two people see the same film. At the time, I had thought of my films as explorations of the purgatorial dimension of the cinema of blindness, of an inability to see because of the speed of succession of images. I was surprised, however, that the experience was the opposite—of the indelibility of the image received at this speed. I remember, years ago, the art critic Stuart Morgan saying that the connection between collage and cinema in my work was obvious, that there was a self-evident connection between physical cutting and cinematic montage. But I never found out what was so obvious to him and so mysterious to me. The experimental filmmaker Hollis Frampton once imagined an ‘infinite film’. It was not quite a loop, but it did go on forever. He wrote: ‘The infinite film contains an infinity of endless passages wherein no frame resembles any other in the slightest degree and a further infinity of passages wherein successive frames are as nearly identical as intelligence can make them.’ Popular narrative film stays away from endless difference and endless sameness. It occupies a small mid-ground of ‘sentence-length’ shots, neither too short to be incomprehensible nor too long to be intolerable. By contrast, avantgarde cinema gravitates to those two extremes. At one end, there is the film built up from rapid cuts, and, at the other, the long single take. In general, the shorter a film’s shot, the more like a photograph it gets, until one ends up with shots comprised of single frames. The longer the shot, the more like a photograph it gets too; the continuous ‘stare’ of the lens giving us a ‘picture in motion’. Horse bypasses or combines both, with endlessly different frames, producing the feeling of static sameness. But, coming back to Morgan’s point, while I see a relation between your collage cuts and a filmmaker’s cutting, which is underscored by your use of still photographs derived from movie productions, in the end the two are profoundly different. Combining printed photographs is really nothing like consecutive shots of a film on a screen. I made a number of ‘still films’ at college. They were mostly sequences of words, but the final one, The End, was made using a still postcard image of Big Ben at sunset, composed similarly to Andy Warhol’s film, Empire. With the avantgarde logic of the time, I thought of The End as superseding Empire by extending the twenty-four-hour film to one which was potentially infinite, as well as picking out everyone’s favourite part of Empire (the sunset), and freezing the alternative British emblematic tower. The film was never made because the rostrum camera at the Slade had been reserved indefinitely for Marcel Broodthaers’s film works. Finally, I left it as a series of vertically arranged, identical still images, in the manner adopted at the time by structuralist cinema. The collage, which is owned by the Tate, is called The End, The Film. I love the point you made about how, at either extreme—with slowness and speed—the film resembles photography. And that is what I felt I was doing with these films, carving out territory between two kinds of stillness, between instantaneity and incessancy. It is also between conscious control (holding on to something at the centre of perpetual difference) and letting go (allowing for the accidental to engage the unconsciousness). Each film project is trying to achieve a different kind of balance between consciousness and unconscious reception, and, as you have said, between different aspects of the photographic. I like the idea that the film collages can open up something like that within the photographic. (With my suggestion, that editing is like carving, I was thinking about my films like Cathedral (2013) and Crowd, where I start with a lot of quite unordered material and create a central image or continuity by cutting out extraneous deviations.) I am reassured that you cannot find a direct connection between cutting in the collage sense and in the cinematic sense. The collagist’s cut and the filmmaker’s cut are alike: excised parts are brought into a relation with each other. Of course, a filmmaker is usually stuck with a consistent frame shape. With your collages you are interested in cutting into or across the frame. Physically, cutting occurs across the image, but it is interesting that you use the phrase ‘cutting into’. From the beginning, I thought of my collages as cutting into, opening up. That is why so many of my early titles related to surgery: Incisions and Excisions. I wanted to open up a space that I thought of as closed; in other words, to introduce a seam into what was seamless about the media image. Perhaps it was a way of making bodily contact with what seemed remote from touch. Somehow, the cut, in creating a sense of here, also helps create a feeling of depth—of there. Certainly, the use of two images is about creating a ‘before’ and a ‘behind’. I think this applies both to my intercut film stills, where you see an image behind, through an aperture in an image on top, as well as with the postcard Inserts and Masks. In the context of filmic material in front and behind inevitably become metaphors for temporal succession or perhaps they satisfy a demand denied by cinema of simultaneity. Over the years, I have been drawn to cinematic images, mostly from the 1940s and 1950s, and to postcards from the interwar period, so there is also an historical regression in the spatial unfolding of depth. Let’s go back to the question of fascination, with which we began. Is there something about fascination that is beyond the temporal? Although your work has changed across the decades, your central fascinations have remained remarkably consistent, unwavering. It probably looks more unwavering from the outside. I sometimes feel defeated by the sheer scale of my collection and the multiplicity of my image fascinations. I feel pulled in too many directions at once. But, once I overcome this, usually by picking up on one of the many loose ends left in the processes of sorting and cutting, I find the sifting process a way of overcoming these pressures. Usually, through a couple of digressions and diversions from the first point of entry into the work, I am lost in it. Everyone who has been lost in their work knows that its pleasure is an escape from the usual order of time. It is different from the arrest that occurs in finding and this is where, for me, the time of fascination takes over, perhaps when just momentarily we are robbed of the power to make sense of what we are looking at. Blanchot believes that the promise of the image is in making contact with the eternal: In the image ‘we find, as pure pleasure and superb satisfaction, the transparent eternity of the unreal’. I am open to all these suggestions.